Following the release of Wonderful, Glorious's predecessor, 2010's Tomorrow Morning [which was the closing of the trilogy started with June 2009's released Hombre Lobo (the second part being January 2010's release of End Times) – see reviews by yours truly, of the chronologically latter albums, posted 24/02/ 2010 and 23/08/2010 respectively for more details], Eels as a band (mastermind Mark Oliver Everett alias E, plus guitarists The Chet and P-Boo, bassist Koool G Murder and drummer Knuckles) first toured in promotion of the album, and E subsequently built a new studio in his hometown of Los Feliz in Southern California, which he subsequently dubbed “The Compound”. 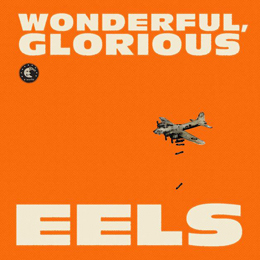 The end result is an exiting/ exited album with a definite Hard Rock sound, the likes we hadn't really heard of Eels in a while. An album also with a very positive lyrical message, as opposed to the often melodramatic moods of the artist on his previous albums (one which has already led to sometimes contradicting comments from critics in the media...the one praising the positivity, the other claiming there's a fakeness about it – go figure!). Although I just mentioned a general Hard Rock sound, there's still diversity in the songs, which occasionally veer to a balladesque touch (check “You're My Friend” and “I Am Building A Shrine” for measure, for instance). Can't believe it? Just surf on over to (http://) eelstheband/wonderfulglorious, and liten to the two songs posted there. These same songs can also be found (also in video form) at (www.) myspace.com/eels, alongside several songs from previous albums. For 30-second samples of more tracks, check the album's page at one of your trusted online sales websites! By the way, this album was also released as a deluxe double CD set, the bonus CD including 5 extra non-album songs, 4 songs recorded live in 2010 and 2011, and a live session for US radio station KEXP. If you are an Eels fan, you know what to do! Meanwhile, I'm so excited about this album that I'm gonna exceed the ratings I gave the previous ones!